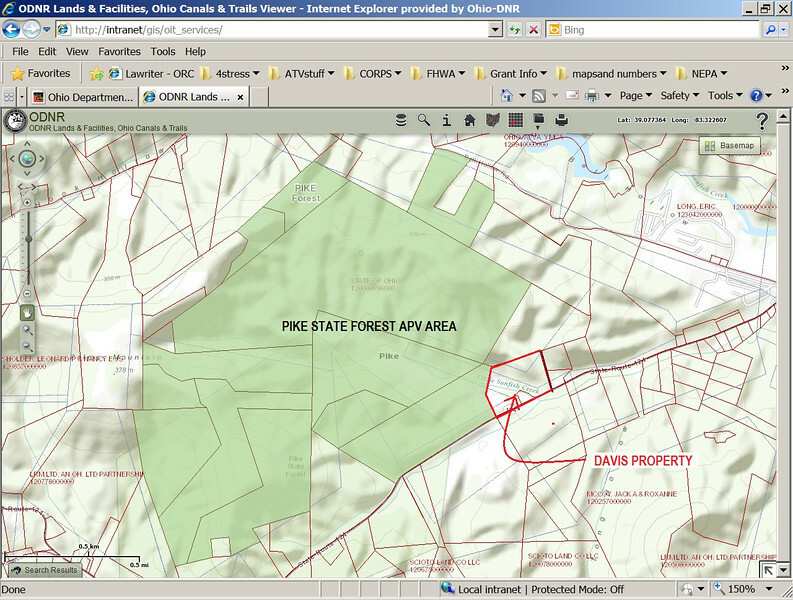 The ODNR Division of Forestry is very happy to report that ODNR closed on the Davis property adjacent to the Pike State Forest APV area on October 21st, thus adding almost 24 acres to the existing 861 acre APV area. Conceptual plans on how to best incorporate this new area into the APV riding area are currently in process. The new property has excellent road frontage as well as a nice barn and small house. That’s right kiddies for the first time EVER there has been a purchase made of land with money from our trail fund, the SRV Fund. This is the type of goal we at OMTA have been working towards for a long time. Constant pressure on public officials and state employees made this happen. No 24 acres is not a HUGE amount of land, but since this is the first time land has been purchased with our fund it is a HUGE deal. The fund has existed for something like 30 years, and the only other expansion I can recall in all that time is the 2 miles added at Maumee State Forest recently. All of us at OMTA hope this is just the beginning and that the tide is finally turning, but we will not be sitting back and taking a break. We will still continue to press on the other issues, while at the same time making sure that ODNR does the best job possible of using this piece of land to benefit the OHV Community. That means we are not going to let them just slap down another 2 miles of trail and cheer, and we will also make sure our members are ready to go when volunteer labor is needed. In fact we have a meeting of the provisional SRV Advisory board on the 13th of this month where we will hear what ODNR’s plans for the property are. I would be interested in volunteering with the trails. Who should I contact? Jim what part of the state do you live in and what do you ride? Just would like to say I would like to possibly see some trails that will accomadate UTV’s like the rhino that are wider than 50″…..Hard to find that on state land. Are there any plans to include single track for us Dirtbikers? Nothing against quad trails, but it would be nice to have some single track that is specific for Dirtbikers. I would be interested in helping create these trails if possible. George and Troy, both single track for dirt bikes and wider trails for SxS are issues we are pushing with ODNR. Wider trails for SxS will be tougher as we need to change some language in Ohio law that restricts vehicle width on trails. If you go to an open riding area like Perry State Forest (as opposed to a designated trail system like Wayne), you can find some single track if you explore. Note that not all of the riding area at Perry is open, Jim is referring to the part that is a designated open scramble area. Congrats on the land purchase! What other expansion plans are you currently working on? How can I help spread the word? Ryan, tell every rider you know that there are dedicated folks pushing for more trail to ride on for Ohio OHV enthusiasts. Then go a step further, start a local OMTA member club to help us do more. We have a program to help you, and it includes a small grant to cover some start up expenses.